Another people who were destroyed and who are mentioned in various Surah of the Quran is Ad, who are mentioned after the people of Nuh. Being sent to Ad, Hud summoned his people, just like all the other prophets had done, to believe in Allah without ascribing partners to Him and to obey him, the prophet of that time. The people reacted to Hud with animosity. They accused him of imprudence, untruthfulness, and attempting to change the system their ancestors had established. To the Ad People (We sent) Hud, one of their own brethren. He said: O my people! worship Allah! ye have no other god but Him. (Your other gods) ye do nothing but invent! O my people! I ask of you no reward for this (Message). My reward is from none but Him who created me: Will ye not then understand? They said: O Hud! No Clear (Sign) that hast thou brought us, and we are not the ones to desert our gods on thy word! Nor shall we believe in thee! He said: I call Allah to witness, and do ye bear witness, that I am free from the sin of ascribing, to Him, Other gods as partners! so scheme (your worst) against me, all of you, and give me no respite. I put my trust in Allah, My Lord and your Lord! There is not a moving creature, but He hath grasp of its fore-lock. Verily, it is my Lord that is on a straight Path. So when Our decree issued, We saved Hud and those who believed with him, by (special) Grace from Ourselves: We saved them from a severe penalty. Such were the Ad People: they rejected the Signs of their Lord and Cherisher; disobeyed His messengers; And followed the command of every powerful, obstinate transgressor. Behold, their brother Hud said to them: Will ye not fear (Allah)? So fear Allah and obey me. No reward do I ask of you for it: my reward is only from the Lord of the Worlds. Do ye build a landmark on every high place to amuse yourselves? And do ye get for yourselves fine buildings in the hope of living therein (for ever)? And when ye exert your strong hand, do ye do it like men of absolute power? Now fear Allah, and obey me. Yea, fear Him Who has bestowed on you freely all that ye know. They said: It is the same to us whether thou admonish us or be not among (our) admonishers! The people who showed animosity to Hud and rebelled against Allah, were indeed destroyed. A horrible sandstorm annihilated Ad as if they had never existed. At the beginning of 1990, there appeared press-releases in the well-known newspapers of the world declaring Fabled Lost Arabian city found, Arabian city of Legend found, The Atlantis of the Sands, Ubar. What rendered this archaeological find more intriguing was the fact that this city was also referred to in the Quran. Many people who, since then, thought that Ad recounted in the Quran were a legend or that their location could never be found, could not conceal their astonishment at this discovery. The discovery of this city, which was only mentioned in oral stories of Bedouins, awoke great interest and curiosity. All of these names mean Fortunate Arabia, because the people living in that region in old times were known to be the most fortunate people of their time. Well, what was the reason for such a designation? Their good fortune was in part due to their strategic location - serving as middlemen in the spice trade between India and places north of the Arabian peninsula. Besides, the people living in this region produced and distributed frankincense, an aromatic resin from rare trees. Being highly favoured by the ancient communities, this plant was used as a fumigant in various religious rites. In those times, the plant was at least as valuable as gold. The English researcher Thomas, described these lucky tribes at length and claimed that he found the traces of an ancient city founded by one of these tribes. (9) This was the city known as Ubar by the bedouins. In one of the trips he made to the region, the bedouins living in the desert had shown him well-worn tracks and stated that these tracks led toward the ancient city of Ubar. Thomas, who showed great interest in the subject, died before being able to complete his research. Clapp, who examined what the English researcher Thomas wrote, was convinced of the existence of the lost city described in the book. Without losing much time, he started his research. Clapp went on to study the ancient manuscripts and maps in the Huntington library in California. His aim was to find a map of the region. After a short research, he found one. What he found was a map drawn by the Greek-Egyptian geographer Ptolemy in 200. A.D. In the map was shown the location of an old city found in the region and the ways that led to this city. Meanwhile, he received the news that the pictures had been taken by NASA. In the pictures, some caravan trails became visible which were difficult to identify with the naked eye, but could only be seen as a whole from the sky. Comparing these pictures with the old map he had to hand, Clapp finally reached the conclusion he was looking for: the trails in the old map corresponded with the trails in the pictures taken from the satellite. The final destination of these trails was a broad site understood to have once been a city. 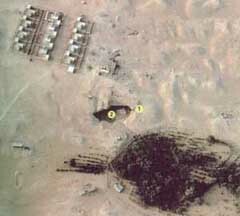 The location of the city of Ad was discovered by photographs taken from the Space Shuttle. On the photograph, the place where caravan trails intersect is marked, and it points towards Ubar. 1. 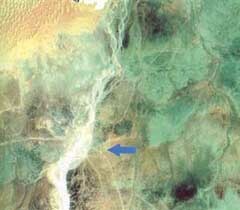 Ubar, could only be seen from space before excavations were made. 2. A city 12 metres below the sands was uncovered by excavations. Finally, the location of the legendary city which had been subject of the stories told orally by the bedouins was discovered. After a short while, excavations began and remains of an old city started to be uncovered under the sands. Thus, this lost city was described as the Atlantis of the Sands, Ubar. Well, what was it that proved this city to be the city of the people of Ad mentioned in the Quran? So far, we have seen that Ubar could possibly be the city of Iram mentioned in the Quran. According to the Quran, the inhabitants of the city did not listen to the prophet Hud, who had brought a message to them and who warned them, and so they perished. The identity of Ad who found the city of Iram has also created much debate. In historical records, there is no mention of a people having such a developed culture or of the civilisation they established. It might be thought quite strange that the name of such a people is not found in historical records. On the other hand, it shouldnt be so surprising not to come across the presence of these people in the records and archives of old civilisations. The reason for that is that these people lived in South Arabia, which was a region distant from other people living in the Mesopotamia region and the Middle East, and which only had a restricted relationship with them. It was a common situation for a state, which is scarcely known, not to be recorded in the historical records. On the other hand, it is possible to hear stories among people in the Middle East about Ad. The most important reason why Ad have not been mentioned in the written records is that written communication was not common in the region at that time. Therefore, it is possible to think that Ad founded a civilisation but this civilisation had not been mentioned in the historical records of those other civilisations that kept documentation. If this culture had existed a little longer, maybe much more would be known about these people in our day. There is no written record of Ad, but it is possible to find important information about their descendants and to have an idea about Ad in the light of this information. The first place to be looked at while searching for the traces of a probable civilisation established by Ad or their descendants, is South Yemen, where The Atlantis of the Sands, Ubar is found and which is referred to as Fortunate Arabia. In South Yemen, four peoples have existed before our time who are named Fortunate Arabs by the Greeks. These are the Hadramites, Sabaeans, Minaeans and Qatabaeans. These four peoples reigned for a while together in territories close to each other. Many contemporary scientists say that Ad entered into a period of transformation and then re-appeared on the stage of history. Dr. Mikail H. Rahman, a researcher at the University of Ohio, believes that Ad are the ancestors of the Hadramites, one of the four peoples who lived in South Yemen. Appearing around 500 B.C., The Hadramites are the least known among the people called Fortunate Arabs. These people reigned over the region of South Yemen for a very long time and disappeared totally in 240 A.D. at the end of a long period of decline. The name of Hadrami hints that those may be the descendants of Ad. The Greek writer Pliny, living at the 3rd Century B.C. referred to this tribe as Adramitai - meaning the Hadrami. (11) The termination of the Greek name is a noun-suffix, the noun being Adram which immediately suggests that it is a possible corruption of Ad-i Iram mentioned in the Quran. The Greek geographer Ptolemy (150-100 A.D.) shows the south of the Arabian Peninsula as the place where the people called Adramitai lived. This region has been known by the name of Hadhramaut until recently. The capital city of the Hadrami State, Shabwah, was situated at the west of the Hadhramaut Valley. According to many old legends, the tomb of the prophet Hud, who was sent as a messenger to Ad, is in Hadhramaut . . Historical records say that the Hadramites had gone very far in the agriculture of frankincense, one of the most valuable plants of the time. They had found new areas of usage for the plant and widened its usage. The agricultural production of the Hadramites was much higher than production of this plant in our day. Although the above statement of Photius does not directly refer to the Hadramites, it does give an idea of the affluence and building prowess of the people living in the region. Greek classical writers Pliny and Strabo describe these cities as adorned with beautiful temples and palaces. When we think that the owners of these cities were the descendants of Ad, it is clearly understood why the Quran defines the home of Ad as the city of Iram, with lofty pillars (Surat al-Fajr: 7). Today, the landscape that someone, who travels to Southern Arabia, would most frequently come across is the vast desert. Most of the places, with the exception of the cities and regions that have been later afforested, are covered with sand. These deserts have been there for hundreds and maybe thousands of years. But as we have noted before, Ubar, which has been identified with the city of Iram, and any other place which is likely to have been the residence of Ad, is totally covered with desert today. So, why did Hud use such an expression while warning his people? The answer is hidden in the climatic changes of history. Historical records reveal that these areas which have turned into desert now, had once been very productive and green lands. A great part of the region was covered with green areas and springs as told in the Quran, less than a few thousand years ago, and the people of the region made use of these endowments. The forests softened the harsh climate of the region and made it more habitable. Deserts existed, but did not cover such a vast area as today. In Southern Arabia, important clues have been acquired in the regions where Ad lived, which could cast a light upon this subject. These show that the inhabitants of that region used a highly developed irrigation system. This irrigation most probably served a single purpose: agriculture. In those regions, which are not appropriate for life today, people once cultivated the land. The Greek classical writer Pliny had described this region as being very fertile, and mist-covered with forested mountains, rivers and unbroken tracts of forests. In the inscriptions found in some ancient temples close to Shabwah, the capital city of the Hadramites, it was written that animals were hunted in this region and that some were sacrificed. All these reveal that this region was once covered with fertile lands as well as desert. The speed with which the desert can encroach can be seen in some recent research done by the Smithsonian Institute in Pakistan where an area known to be fertile in the middle ages has turned into sandy desert, with dunes 6 meters high, the desert being found to expand on average 6 inches a day. At this speed, the sands can swallow even the highest buildings, and cover them as if they had never existed. Thus excavations at Timna in Yemen in the 1950s have been almost completely covered up again. The Egyptian pyramids were also entirely under sands once and were only brought to light after very long-lasting excavations. Briefly, it is very clear that regions known to be desert today could have had different appearances in the past. In the Quran, Ad are said to have perished through a furious wind. In the verses, it is mentioned that this furious wind lasted for seven nights and eight days and destroyed Ad totally. Though warned previously, the people had paid no attention to the warnings whatsoever and continuously refused their messengers. They were in such delusion that they could not even understand what was happening when they saw the destruction approaching them and continued with their denial. Ahqaf means sand dunes in Arabic and it is the plural form of the word hiqf which means a sand dune. This shows that Ad lived in a region full of sand dunes, which provided the most logical ground possible for the fact that they were buried by a sand storm. According to one interpretation, ahqaf lost its meaning of sand hills and became the name of the region in south Yemen where Ad lived. This does not change the fact that the root of this word is sand dunes, but just shows that this word has since become peculiar to this area because of the abundant sand dunes in the region. 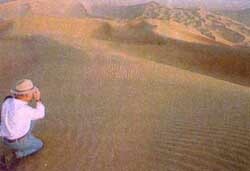 The region where Ad lived was full of sand dunes. As a consequence, it can be said that historical and archaeological finds indicate beyond reasonable that Ad and the city of Iram must have existed and were destroyed as described in the Quran. By later researches, the remains of these people have been recovered from the sands. What a person has to do is bear this unchangeable fact in mind all the time and understand that the greatest and the most honoured is always Allah and that one can only prosper by adoring Him.